The picturesque visual design of Big-Eyes the Little Owl was created by Jaka Judnič, a director, scriptwriter and painter most known for his famous TV commercials from the 1970s and 80s. 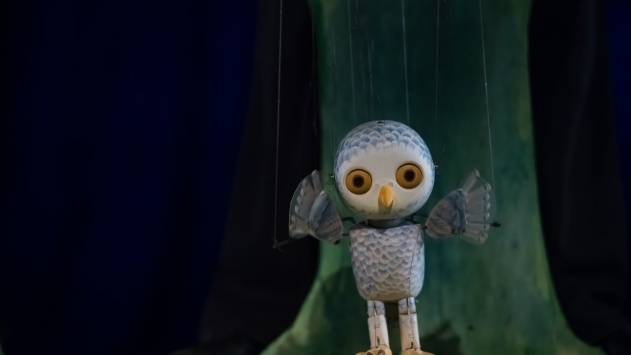 In a colourful chain of events and a comic-book intrusion in the visual design, Big-Eyes the Little Owl has become one of the most endearing Slovenian marionette performances. In 2018, at the beginning of the festive season marking the theatre’s 70th anniversary, Big-Eyes the Little Owl, which, with its simple dramaturgy and scintillating dialogues, enters the world of children’s play, imagination, whimsicalness and conceitedness, returned to the puppet stage, newly directed by Brane Vižintin and visually designed by illustrator Suzi Bricelj. Brane Vižintin, a puppet artist, actor and animator of the Ljubljana Puppet Theatre, who received the Župančič Award in 2013, is certainly one of the greatest masters of puppet animation in Slovenia. He specialises in various puppet techniques, knows their workings and the various possibilities of their creative use and animation. Last year, upon the 30th anniversary of the first staging of the legendary Sapramouse, he directed a refreshed version of it.